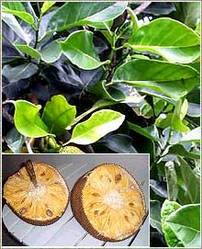 Uses : The leaves are useful in fever, boils, wounds , skin diseases. The young fruits are acrid, astringent, carminative and tonic. The ripe fruits are sweet, coolong, laxative, aphrodiasiae and tonic. The seeds are sweet, diuretic, aphrodisiac and constipating. The wood is nervine, sedative and is usefull on vonvulsions. The latex is usefull in dysopia, opthalmities and pharyngitis.The Chinese consider jackfruit pulp and seeds tonic, cooling and nutritious, and to be "useful in overcoming the influence of alcohol on the system." The seed starch is given to relieve biliousness and the roasted seeds are regarded as aphrodisiac. The ash of jackfruit leaves, burned with corn and coconut shells, is used alone or mixed with coconut oil to heal ulcers. The dried latex yields artostenone, convertible to artosterone, a compound with marked androgenic action. Mixed with vinegar, the latex promotes healing of abscesses, snakebite and glandular swellings. The root is a remedy for skin diseases and asthma. An extract of the root is taken in cases of fever and diarrhea. The bark is made into poultices. Heated leaves are placed on wounds. The wood has a sedative property; its pith is said to produce abortion. Fruits release a loose white mass that bleeds a milky, sticky sap often used as glue. Roots are credited with antidiarrhoeal property.